Select a Mason feature to get started. 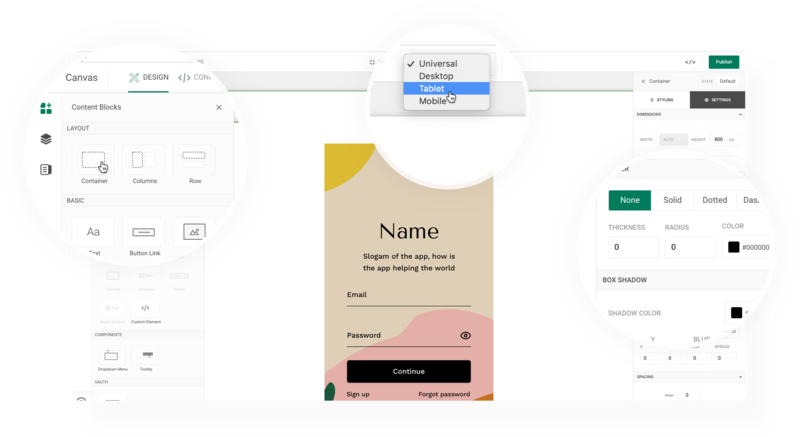 Start with a pre-built template for a quick login flow, sign-up experience, content feed, and more. Or, start from scratch with a blank Canvas and build your custom experience visually. So what’s a feature, exactly? Mason features are functional pieces of UI that perform common—or custom—client-side application functions. Some examples include login flows, content feeds, and authentication experiences. You can also use Canvas to create a custom UI from scratch. Use the Mason builder to customize your pre-built feature or create a unique UI from scratch. Use containers and columns to organize your UI, then drop in elements like images, text, input forms, and more. Use the styling options to achieve pixel-perfection. What else can Mason do? Mason defies the typical rigid UI templates most web builders force you to use. Your customization options are endless! Learn more about what you can build with Mason in the Mason Academy. Mason is designed for everyone on your team, from product pros to marketing to engineering and beyond. 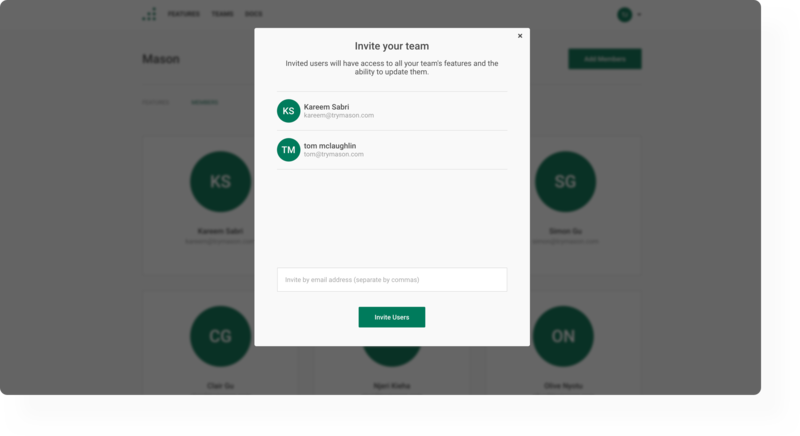 Collaborate with your team to ensure every stakeholder’s feedback on your feature gets incorporated, faster than ever before. So do I need to write code to use Mason? No! Mason was built to give modern product teams the ability to visually design their front-end without needing to write a single line of code. 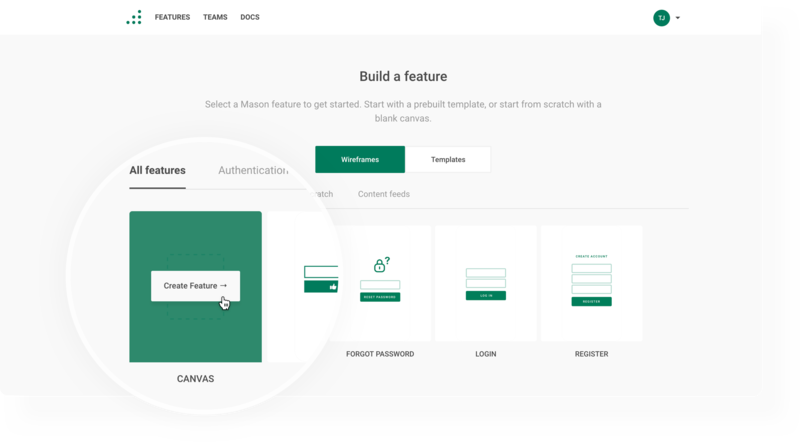 Anyone on your team can use the Mason builder to create a fully-functional front-end experience. 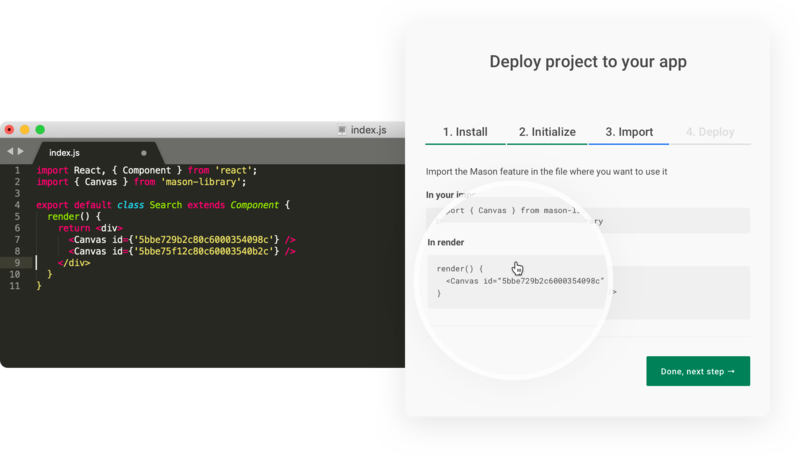 Grab your favorite developer and ask them for five minutes—they’ll be able to quickly add the Mason library to your application or site. Then they’ll use the Export function to grab your feature’s code and drop it into your codebase. Boom—you’re live! That sounds complicated. Are you sure? With Mason, you don’t need to write code… but you do need a developer with access to your codebase. They’ll have no trouble setting up your feature, and can move on to more interesting coding challenges quickly. Check out our developer docs for more details. Need to make a quick copy change? What about changing a button color or replacing an image? With Mason, changes like that take seconds, and you don’t have to wait on a developer or deployment cycle to do it. Anyone can make an edit? Really? That’s right! Your team can log in and access your features for rapid hotfixing in minutes. Just make the change inside Mason, hit Publish, and your edit is live—immediately—no coding required. Ready to build with Mason? We can’t wait to see what you’ll create. Get started today.